When implementing social collaboration in your workplace, remember that activity streams can include feeds from automated systems as well as activity from individuals. Application feed items from automated systems can then include links back to a related form or report, or embedded functionality (like the ability for a user with the right authority to approve an invoice). Application feeds can be useful as long as the information in them doesn’t drown out human activity, defeating the goal of making social collaboration personal and welcoming rather than impersonal and robotic. For example, you wouldn’t want an activity stream notification about every updated field in a customer record. On the other hand, a status change from prospect to signed customer could be a significant event worthy of sharing. Limiting an activity stream for only application updates: One way of keeping activity streams from becoming cluttered with application activity is to provide a stream just for application updates. Post ranking within the platform: Alternatively, the platform may weight automated posts lower in the rankings of the posts that should be displayed first, elevating them only if users comment on them or mark them important. The platform designers make many of these choices, at least in terms of deciding the default behaviors. If you’re the system administrator or community manager, your job is to decide which application feeds make sense and how to configure them to be productive rather than distracting. Automated feeds aren’t the only way applications can be integrated with the feed. Another approach is to embed a social comment feed within the application and have comments posted there mirrored in the main feed. 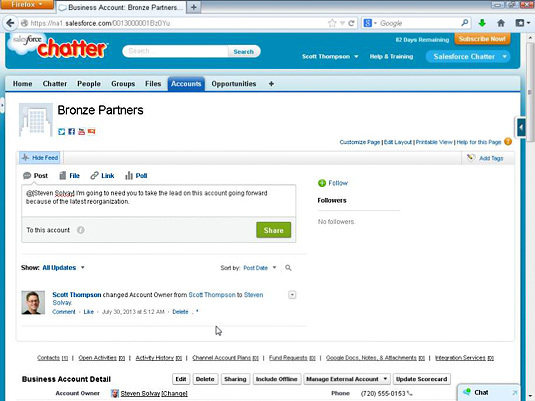 An example would be commenting on a Salesforce.com CRM customer account record, rather than entering data into the record itself, leveraging Salesforce.com’s Chatter social collaboration tool, as shown in the following figure. This can be a good way for employees to document their work, allowing others to see the history of a customer relationship. Adding Chatter comments to a Salesforce.com customer account record. Even in the absence of such tight integration, it may be possible to link to content in web-based applications that provide a distinct web address for each record and share comments on the collaboration network. Jive, for instance, provides the Jive Anywhere browser extension that makes that sort of loose application integration easier. Jive Anywhere also provides a convenient way of referencing external websites and resources. When the plug-in is installed and activated, your browser displays a Discuss button on the right margin of every web page. Clicking that button reveals the commenting user interface shown in the following figure. 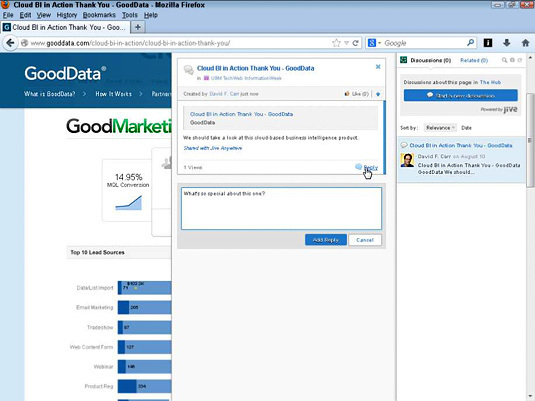 In this example, you can see how to link to a publicly accessible demo of GoodData’s web-based business intelligence tool and add comments about it. The comment or question you post in this sidebar will also be displayed in your Jive collaboration network. A collaborator who follows the link and also has Jive Anywhere installed can continue the discussion using the same social sidebar user interface. Jive Anywhere adds a social sidebar to your browser, making it possible to start a discussion from any web page or application.